Life is Simple! Are you kidding? Read on. These are the opening comments in my recently completed book, Life Is Simple Hard But Simple. All my life I have been working, preparing, researching and studying for this day. Just like everyone who has walked this magical world I have had challenges. Whether challenges are financial, physical, emotional or spiritually-we all need to find a way to conquer. YES, I truly believe that Life Is Simple Hard But Simple (just the way God wanted it). Inside these pages you will discover that life is intended to be simple-hard-but simple. When we understand this concept it becomes much easier to appreciate what is going on in our lives. Throughout my life I have discovered certain building blocks that guide me on a daily basis. I've attempted to write the book to myself-giving it a One-to-One feel. My objective is not to convince you to think like me, but rather to convince you to challenge the way you think. You will benefit by learning why you should have a personal mission, how to define such a mission and most importantly-how to fulfill your very own personal mission. It closes with guidance for those inevitable rough spots in life and lays a strategy for achieving and enjoying success on a daily bases. You can read this book in an evening. However, working with this valuable information can then derive a lifetime of benefits. If you are ready to discover what awaits you inside Life Is Simple Hard But Simple take that first step and buy a copy today. The book will be sent to you immediately via e-mail in less than 5 minutes. You can be reading and on your way to a great mission! P.S. Dr. Harry Wiant, Jr. (Ibberson Chair of Forest Resources Management, Penn State) said, "My immediate reaction to Life Is Simple Hard But Simple was that it is so practical and positive that it should be required reading for anyone with a life, and that's pretty inclusive!" P.S.S. If you aren't ready to take that first step read on to learn more about what awaits you inside Life Is Simple Hard But Simple. You will then be ready for the journey. Part I - What Is This All About? What Guides Your Daily Life and Adventures? How to Accept and Appreciate Change. 4 Step Process for Analyzing Change. How to Utilize Biblical Anchors. "The author delivers a powerful message in an "easy to read and understand" style. Life Is Simple Hard But Simple, with the subtle reference to the importance of one's spirituality, offers a common sense way to achieve life's goals both personally and professionally at whatever stage you are in life." 3 Questions That Everyone Will Ask In Their Lifetime. "Terry Meiser writes with the life experience, wisdom, common sense and sure-footedness of the kind of guide you'd follow on a hazardous wilderness trek. Life Is Simple is a beautiful book written by a man who quite plainly knows what living is really like, all the ups and downs, joys and sorrows, hopes and disappointments included. This book is terrifically practical, quick to read, filled with humor and life interest...and it packs a very pleasurable punch! I highly recommend this tremendous book!" What do you want to accomplish with your life-discover your true calling. Discover what a Personal Mission is and is not. How to develop your own Personal Mission. Draw out the best you have to offer. Create your Personal Mission-Pain FREE and Without Stress. Discover what the secret is to a successful Personal Mission. How are you going to be remembered when you pass away? Do you need to change your Personal Mission regularly? Who should you share your Personal Mission with? "I would not have guessed this was the author's first book had I not known that fact before reading it. It is a mature statement, well presented, well written. Terry Meiser takes the reader on a journey to help him, whether the reader is in a "pit" in life, or looking how to live happier, this book will give you several strategies, tips, hints, and suggestions to extricate yourself from that pit or improve your happiness." Discover the 25 Pillars that are part of your life even if you do not know it. The key is recognizing these 25 pillars and knowing how to make them part of your daily life. Discover the Pillar that the Idle will Never Benefit From. Discover the Pillar that you must develop to assure a fulfilled life. Discover the standard that LOVE is measured by. Discover the simplest way to make money. Discover the Pillar that will make you impossible to beat. Discover the One Pillar that Holds Everything Together. "This thought provoking and compelling book with its insightful approach provides an answer to the simple as well as the difficult challenges everyone encounters in life which makes it a "must read" for anyone especially those in business today." What the 1st "F" is that can easily be neglected when everything is going well, but long term you can not afford to neglect it. Realize that working for the 2nd "F" is not really work. Should you keep score regarding the 3rd "F"? Understand the importance of the 4th "F" or everything else will cease to matter quickly. The 5th "F" will become a priority by default if you neglect it. 5 unique areas that you must invest in...Time Can't Be An Excuse. "After being married for nearly all of my adult life, my husband and I went through a bitter divorce, which consumed me for two and a half years. I read this book at a time when I finally had accepted the fact that my old life was over and I realized that I must begin anew at the age of sixty-three. The straight forward approach of this book gave me the inspiration that I needed to look at my future with an optimistic point of view. It provided me with a structure in a simple and easy to read format to focus on a new beginning. This is a book to read and reread!" What is the Rocket Fuel that will get you where you want to go? Is going from Point A to Point B always a straight line? Discover how to maintain your direction. Learn what can destroy everything... NO matter how balanced you think your life is. How to avoid getting into a situation that you would have rather avoided. Understand which of the three is the most important. "I have just completed reading his first book and I am pleased to find a wealth of knowledge compiled into an easy to read, easy to understand manual that anyone can comprehend and implement into their daily lives. I highly recommend this book to anyone looking to improve themselves whether it's personally, in the work place, or even their spiritual life." 30 worthwhile subjects to study to expand your mind and make you more knowledgeable. How much information do you need to know on most subjects? 85% of Your Success depends on this one skill. It is everywhere you go...Do you know what it is? The one question to ask before you make a minor or major decision. Understand the process to go through when facing a challenging situation. Discover the factors that can hold you back from your dreams! Discover what REAL failure is...no one needs to experience it! Discover how to appreciate your life and circumstances! 5 Unique Goal Setting Strategies that you can utilize immediately. Valuable technique for taking the tension out of most situations. What is the No. 1 secret to becoming an effective leader? We are all in this business everyday...Like It of Not. The secret to buying art is revealed. This skill will play a major role in determining your quality of life. 2 Techniques for dealing with politics. Tip for knowing when to attack a problem. 2 Techniques for handling the subject of religion with other people. Discover where wise people reside...you might be surprised! Exclusive A---Z list regarding the wonders of nature. 6 Keys to a positive self esteem. The technique for enjoying sports. Are you infected with "stuffitis"? You Need to Understand this skill if you are a leader or follower. The objective of Time Management. The "10 Steps for Thinking"...YES Thinking! "Over the last twenty-nine years I have known R. Terry Meiser as my friend, business partner, coach, and most importantly as my father. He has been a successful C.P.A., business owner, forest steward, husband, father, grandfather, community volunteer, leader and role model. Over the years he has provided guidance, direction, discipline (my sisters needed more than me) and support for me. On November 15, 2006 I meet with my father and he told me that he had written a book. I have heard him talk about writing a book for years. WOW! I was surprised. The book was complete and ready to read. Immediately I loved the title Life Is Simple Hard But Simple. I quickly flipped through the book and was blown away! The book was truly amazing. After reading the book I told Dad that he needed to release the book quickly. Now today the book is available as an E-book-I never thought my Dad would have his own E-book. Life Is Simple Hard But Simple is a wonderful book that we can all receive something from. I would encourage you to invest in yourself and get your hands on a copy. You will not be disappointed. I have been a satisfied customer for twenty-nine years." Link 1-Discover the #1 link that makes life become easier. Link 2-How to think more clearly. Link 3-What only you can control. Link 5-What people judge you by. Link 6-The key for controlling your surroundings. Link 7-2 Areas you need to act on quickly. Link 8-An area you need to control to keep people from backing away. Link 9-What you can't take back once you've done it. Link 10-2 Areas that feed off one another for your success BUT not independently. Link 11-The most precious piece of time you will ever have. Link 12-How to enjoy your destination when you arrive. Link 13-One commodity that you can't recycle. Link 14-Discover where you want to go. Link 15-You need to sharpen your "saw". Link 16-The toughest 30 minutes you may ever experience...but you need to. Link 17-What you should do when you don't know what to do. "Terry Meiser has written the ultimate self help book. Drawing on the wisdom of the ages, and peppering his writing with current leadership theory and salting it with numerous examples from his own personal experience, he urges each of us to craft our own personal mission statement as the key to a successful life's journey. Meiser writes with a directness and wry humor that will engage the reader from beginning to end." Link 18-What others want you to do for them. Link 19-The most important part of communication you might be overlooking. Link 20-What you will never be penalized for. Link 21-A skill that will make people wonder what you are up to. Link 22-How you can utilize the M.M.F.I. Technique. Link 23-The type of person you must avoid. Link 24-The type of deals you need or it's NO DEAL for anyone. Link 25-The one person you must like. Link 26-Learn the A.S.K. technique to achieve your dreams. Link 27-How you can create prosperity. Link 28-The best experience you can tap into. Link 29-Why you shouldn't ask, "What Does It Cost?". Link 30-When you should go ahead with a decision. Link 32-How you can avoid going to prison. Link 33-Learn how to take the pressure off others and encourage them to work for you. Link 34-When you should do something right now. Link 35-The one secret that will take you a long way in your life. Link 36-Who will always have your back? "This book will be useful to many people, particularly those who have achieved success because of one skill or one product line they have developed, but who are now more reflective and standing back trying to learn how to put it all together." Part III - Is This the Beginning or the End? Yes this may be an option you must consider. How to Quit...FOR GOOD...the 2 step process. When you are in over your head this is the key to turn. "While going through a broken relationship and the loss of a son I read a few books and listened to many self help tapes. 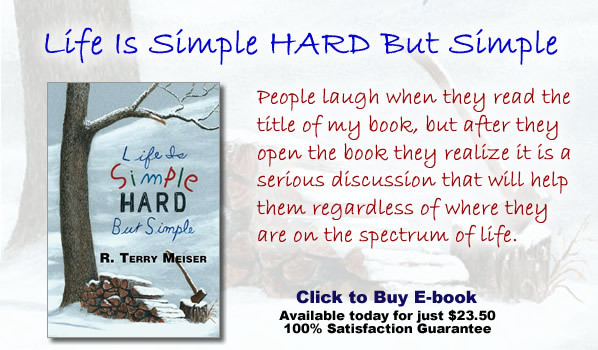 Terry Meiser's Life Is Simple Hard But Simple ranks high in my opinion." What is the most valuable resource we have to offer others? The 2 areas your Personal Mission will impact dramatically. A highly effective and useful definition of success. How to make everyday a success. "Terry's workbook has captured a lifetime of practical and invaluable principles that have changed my life. The workbook format is easy reading; it's hard to put into practice but will change your life." How to create a Personal Mission Stool to guide you through your daily life. Learn to create the Personal Mission Stool in your mind so you can always pull it up on screen. Utilize the stool to determine what part of your life you need to address when a challenge appears. Chapter 14 - Have a Great Mission! How to make Life Is Simple Hard But Simple your personal book. Discover that there are No Excuses for NOT creating a Personal Mission. "Terry Meiser's work is beneficial to the young adult and retiree alike. It forced me to seek answers to questions I had never before had time to confront. This book is a manual for living that challenges the reader to question every aspect of his life, goals and purpose. A quick scan is helpful to everyone, but its true worth is to that person who meditates upon it while desiring to evaluate what he has done in life and what he hopes to accomplish in the future. A well spring of wisdom........."
You've read Life Is Simple Hard But Simple now take it to the next level with 160 biblical anchors. 18 priceless resources that everyone should have in their personal development arsenal. "The book is to expensive." Really? The life expectancy in the world is 64 years. Life Is Simple Hard But Simple is a book that you will utilize throughout your entire life. That is a .37 cent investment per year. I think we can all afford that. "I do not like reading a book on a computer screen." Me either. The book is designed to be printer friendly. When you receive the book before you start to read print a copy...now you can take the book with you anywhere. "What if there is nothing in the book of value to me?" This is very unlikely, but if it were to happen you have a 100% Guarantee or your money back. No questions. Don't worry...you are going to find an abundance of value in Life Is Simple Hard But Simple. "I hate waiting to receive a book. I want to read it now!" I agree. The book will be sent to you via e-mail in less than 5 minutes and you will be reading immediately. "I do not have enough time to read a book." Time is our most valuable commodity. Life Is Simple Hard But Simple was designed to be read in an evening and can be read forward, backward or inside out. If you can find only 1 minute a day for reading this is the book for you. My friend make a promise to me and yourself-make a statement with your life! My intention is to use and adjust this information as long as I live. Beyond that, it is my hope and prayer that now or later, this material will help at least one other person. Make my day-be the ONE! Terry's background includes an accounting degree from Penn State University, 1965, CPA license, 1968, business owner since 1976, married 38 years, three children and four grandchildren. His passions include family, friends and the outdoors...especially the outdoors in Pennsylvania and Wyoming. One of his greatest pleasures is starting with a blank piece of paper and creating something of value. This book certainly fits and fills that objective.